"It is always during a passing state of mind that we make lasting resolutions"
This year resolve to make no resolutions. For most a resolution is a wish or a desire to change something- quitting smoking, exercising more, doing more of this or less of that. But it’s a statistical fact that by the end of the 2nd week of the New Year 33% of the resolutions that were made have already fallen by the wayside. By the end of the year 88% have been given up. All that really happens is that you reinforce to yourself that you are unable to keep your commitments. You temporarily assuage your guilt or frustration with your current situation by making a promise to take action. Underneath your promise you know you won’t complete your commitment but just agreeing to it is almost good enough. In a way it’s like buying a self-help book, you never really read it but it feels good just having it on your book shelf. You plan on reading it someday but in the meantime just knowing that the knowledge is there waiting somehow comforts you. What about New Year’s resolutions? I think the New Year allows us a chance to reboot, to create a starting point for change or milestone to measure new progress from. That is all good. The problem is in the way we approach it. Instead, commit to continue what it is you are doing but at the same time promise yourself that when the time is right and you are ready you will make the commitment to change or modify that particular action. By keeping your word you start to rebuild your integrity with yourself. When the time is right you will be a little stronger and more committed. The first step in learning to understand one’s self and begin the process of self-actualization starts with understanding how you have been operating. How you manage your life. To do that you need to become more aware. To become more aware of everything that is going on inside and outside of you. So this New Year’s eve instead of making a promise you won’t keep, agree with yourself that from now on you will become more of an observer, a watcher. This isn't a promise or a commitment but simply an agreement to shift into a slightly more observant place. I guarantee you can do it and as you do so you will see more and understand more. It’s really part of our basic nature to be observant and watch. It is how we survived as a species for millions of years. This ability is hard wired into us. 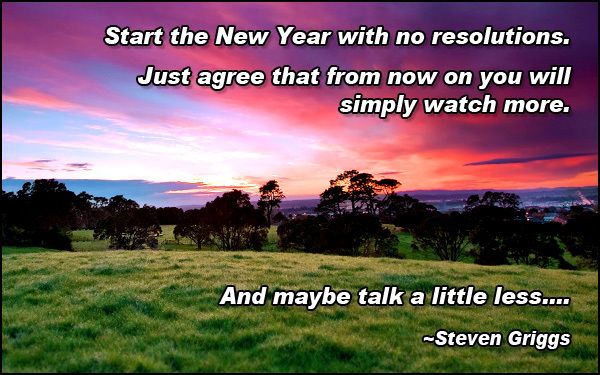 So start the New Year with no resolutions. Just agree that from now on you will simply watch more. And maybe talk a little less…. You will be rewarded with more understanding of yourself and your world. This opens you up to changing and expanding who you are, to becoming more powerful and more free. This January 1st could mark the beginning of the new you.